From William Norwich, the well-known fashion writer and editor, an unforgettable novel about a woman with a secret who travels to New York City on a determined quest to buy a special dress that represents everything she wants to say about that secret…and herself. Sometimes a dress isn’t just a dress. Emilia Brown is a woman of a certain age. She has spent a frugal, useful, and wholly restrained life in Ashville, a small town in Rhode Island. Overlooked especially by the industries of fashion and media, Mrs. Brown is one of today’s silent generations of women whose quiet no-frills existences would make them seem invisible. She is a genteel woman who has known her share of personal sorrows and quietly carried on, who makes a modest living cleaning and running errands at the local beauty parlor, who delights in evening chats with her much younger neighbor, twenty-three-year-old Alice Danvers. When the grand dame of Ashville passes away, Mrs. Brown is called upon to inventory her estate and comes across a dress that changes everything. The dress isn’t a Cinderella confection; it’s a simple yet exquisitely tailored Oscar de la Renta sheath and jacket—a suit that Mrs. Brown realizes, with startling clarity, will say everything she has ever wished to convey. She must have it. And so, like the inspired heroine of Paul Gallico’s 1958 classic Mrs. ‘Arris Goes to Paris, Mrs. Brown begins her odyssey to purchase the dress. For not only is the owning of the Oscar de la Renta a must, the intimidating trip to purchase it on Madison Avenue is essential as well. If the dress is to give Mrs. Brown a voice, then she must prepare by making the daunting journey—both to the emerald city and within herself. Timeless, poignant, and appealing, My Mrs. Brown is a novel for every mother in the world, every woman who ever wanted the perfect dress, and every child who wanted to give it to her. William Norwich is a writer, editor, and video and television reporter. He is the commissioning editor for fashion and interior design at the Phaidon Press. In media circles, he is also known for his editing and writing for The New York Times and Vogue. Norwich is the author of the novel, Learning to Drive, published by the Atlantic Monthly Press in 1996 and the children's book Molly and the Magic Dress published by Doubleday in 2002. 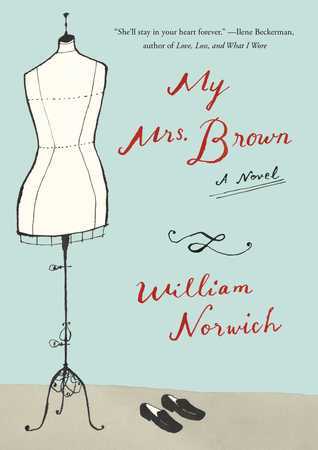 On April 12, 2016, Simon and Schuster will publish Norwich's new novel, My Mrs. Brown. It is the story of one very special woman's search for a particularly meaningful dress. He has also written introductions and essays for many non-fiction books including C.Z. Guest: American Style Icon published by Rizzoli in 2013, Yabu Pushelberg, published by Architecture Interiors Press in 2009, Poolside with Slim Aarons published by Abrams in 2007 and Bright Young Things: New York published by Assouline in 2002. Norwich has appeared on a variety of television interview shows, including Charlie Rose, unscripted shows including The Face and was an on-air correspondent for Full Frontal Fashion where his The Bigger Picture chronicled the enthusiasms of a variety of fashion personalities including Michael Kors and Grace Coddington. He has hosted many videos for Vogue. In May 2012, he co-hosted Live Stream red carpet coverage of the Met Gala that aired simultaneously on Amazon.com, Metmuseum.org, and Vogue.com and in May 2013 he also co-hosted the Live Stream coverage of the Met Gala for Vogue.com, Metmuseum.org, ModaOperandi.com, and Samsung.com. Norwich is active on social media including Twitter, Instagram, and Facebook where he has over 100,000 followers. From May 2010 to June 2011, Norwich was the special consultant to Town & Country magazine on a digital project, website and social media. From 2004 to May 2010, Norwich was a columnist for Vogue, a contributor to Vogue.com and the entertaining editor of Vogue Living during its publication cycle. In 2008, he contributed to the launch of the website wowowow. From 1999 to 2004, Norwich was the style and entertaining editor of The New York Times Magazine and frequent contributor to The New York Times newspaper. As the style and entertaining editor for The New York Times Magazine, he supervised the launch and publication of two Style and Entertaining magazines each year (later titled T: Magazine) and he produced dozens of weekly stories per year for the Sunday New York Times Magazine about women's, men's and children's fashion, the arts, interior design, food, manners, and entertaining. Prior to joining The Times, Norwich was the editor at large for Vogue beginning in 1989. His responsibilities over that period included editing the People Are Talking About and the Talking Fashion (now Flash) sections of the magazine. From 1993 to 1999 he wrote the weekly Style Diary column for The New York Observer. From 1985 until 1991 he wrote the daily around the town column William Norwich for the New York Daily News. From 1991 through 1993 his daily column appeared in the New York Post. His first job in style journalism was assisting Eugenia Sheppard, in whose memory the Council of Fashion Designers of America gives its Eugenia Sheppard Fashion Journalism Award annually. In addition to writing, and editing, his illustrations and caricatures have been published in Vogue, House and Garden, and New York Magazine. Norwich is a graduate of the writing program at Columbia University (MFA) Hampshire College (BA) and the Pomfret School. Norwich has also been an editor at House & Garden and the U.S. editor of British Vogue. He has contributed to numerous other publications including Vanity Fair and Tatler. In the past year, his writing has appeared in Architectural Digest, Elle Décor, New York Magazine, Vogue, and The New York Times. This was totally not my typical read, but funny enough, I really liked it. It was pretty humorous at times and the writing was beautifully done. I think I fell in love with this book. It's funny because I like programs about fashion, I'm a total addict for Project Runway but I have little interest in wearing the clothes myself. I mostly enjoy the creativity of the designers and Tim and Heidi of course.